The first stage of SpaceX's Falcon 9 rocket attempts to land on an unmanned drone ship in the Atlantic Ocean on April 14, 2015. The rocket stage nearly succeeded, but toppled over on the deck. SpaceX's daring reusable-rocket test last week came up just short because of an issue with a "throttle valve," company founder and CEO Elon Musk said. 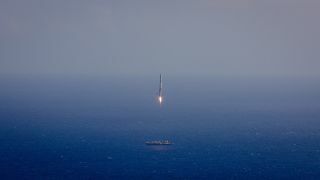 The private spaceflight company tried to bring the first stage of its Falcon 9 rocket down for a soft landing on an unmanned "drone ship" in the Atlantic Ocean on April 14, during the successful launch of its robotic Dragon capsule toward the International Space Station on a cargo mission for NASA. The bold maneuver nearly worked: The rocket stage managed to hit the ship but ended up toppling over on the deck and exploding. SpaceX engineers have figured out what happened, Elon Musk said. "While the rocket does look rather tall & tippy, a stable landing is no problem with proper throttle response," Musk added in another tweet, linking to a 2014 SpaceX video showing the company's prototype Falcon 9 Reusable rocket acing a soft touchdown during a test in Texas. The April 14 Falcon 9 rocket landing attempt was the second near-miss in the last three months for SpaceX, which is developing reusable-rocket technology in a bid to slash the cost of spaceflight. A try on Jan. 10, during the previous Dragon launch, also ended with the Falcon 9 first stage crashing on the drone ship's deck. The Jan. 10 effort failed because the rocket stage's stabilizing "grid fins" ran out of hydraulic fluid, Musk has said. SpaceX holds a $1.6 billion contract with NASA to fly at least 12 resupply missions to the space station using Dragon and the Falcon 9. The April 14 liftoff initiated the sixth of these missions, all of which have been successful to date.